Background The development of a recruitment strategy requires nurse researchers to consider the avenues available to them to fully investigate a phenomenon. In many cases, this will mean that they invite members of the public to be participants in their research. Successfully advertising the research project to potential participants requires a targeted approach, so that the participants will contribute to a data set that is sufficiently representative and analysis will elicit answers to the research questions. Societal changes in communication patterns and in media consumption have led to a downturn in traditional forms of media, such as television, radio and printed newspapers, magazines and newsletters. Increasingly, the public is using social media instead of traditional media. This change has implications for the design of research and researchers will have to adapt their recruitment strategies to include social media, if they are to collect representative rich data that can be analysed and reliably inform the findings of research. 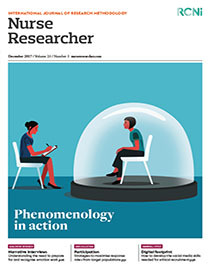 Aim To discuss the importance of rigorous research designs and to provide an example of a study that demonstrates how mental health researchers, investigating help and support for young people’s mental health, can adapt their traditional recruitment practices and applied this new knowledge to recruitment using social media. Discussion A carefully designed social media recruitment process was particularly useful in attracting informative participant respondents who were able to provide meaningful and rich data relevant when responding to particular research questions. Engineering the participant user experience, such as using a minimum number of keyboard clicks to enter the online survey, mitigated the risk of drop out or incomplete responses. Conclusion Recruitment to a research study requires a strategy that matches the dynamics of the communication media used by potential participants. Nurse researchers need to be adept in the use of social media applied to health research contexts to ensure that data sets obtain representative samples and to reveal trustworthy, reliable, dependable and valid evidence to support clinical research and practice. Implications for practice The general popularity of social media has led to the public expectation that health information, and in some cases treatment, will be available online. Such a change in communication dynamics in recent times requires that nurse researchers develop new researcher skills and expertise in the proficient use of social media for the purpose of ethical recruitment of participants to health research projects.